Size of this preview: 499 × 600 pixels. English: Bottlenose dolphin (Tursiops truncatus) of the NMMP on mineclearance operations, with locator beacon. 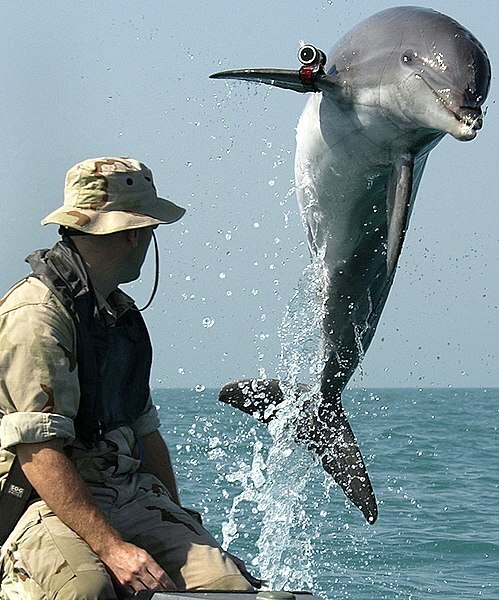 K-Dog, a bottle-nose dolphin belonging to Commander Task Unit (CTU) 55.4.3, leaps out of the water in front of Sgt. Andrew Garrett while training near the USS Gunston Hall (LSD 44) in the Persian Gulf. Attached to the dolphin's pectoral fin is a "pinger" device that allows the handler to keep track of the dolphin when out of sight. CTU-55.4.3 is a multi-national team consisting of Naval Special Clearance Team-One, Fleet Diving Unit Three from the United Kingdom, Clearance Dive Team from Australia, and Explosive Ordnance Disposal Mobile Units Six and Eight (EODMU-6 and -8). These units are conducting deep/shallow water mine countermeasure operations to clear shipping lanes. Français : Un Grand dauphin (Tursiops truncatus) appartnant au NMMP portant une balise de localisation et participant à une opération de déminage dans le cadre de la CTU-55.4.3. La balise sert à repérer l'animal lorsqu'il n'est pas visible. La CTU-55.4.3 est une équipe de déminage en milieu marin regroupant des unités provenant de plusieurs pays anglos-saxons (Angleterre, Australie, Etats unis). This Image was released by the United States Navy with the ID 030318-N-5319A-002 (next). Author U.S. Navy photo by Photographer's Mate 1st Class Brien Aho. English: Bottlenose dolphin of the NMMP on mineclearance operations, with locator beacon. Bân-lâm-gú: Bí-kok NMMP hái-kun ê hùn-liān jîn-ôan, tng-leh hùn-liān hái-ti tiàm hái-té saù-lûi. Cymraeg: Dolffin Trwyn-potel yn gweithio yn egluro ffrwydrynnau am Llynges yr UD. Deutsch: Großer Tümmler (Delphin) der US NAVY bei Minenräumungen, mit Peilsender. Español: Defín nariz de botella del NMMP estadounidense en tareas de limpieza de minas, con una baliza localizadora. Français: Dauphin utilisé pour le déminage dans le cadre du NMMP. Italiano: Un delfino (Delphinus delphis) incaricato di lavori di sminamento al servizio della Marina degli Stati Uniti d'America. Magyar: Az amerikai haditengerészet aknamentesítő palackorrú delfine a lokátorral. Norsk bokmål: Flaskenesedelfin fra NMMP på mineryddingsoperasjon. Norsk nynorsk: Flaskenasedelfin (Tursiops truncatus) frå NMMP på mineryddingsoppdrag. Polski: Delfin butlonosy w trakcie operacji rozbrajania min US NAVY. Português: Golfinho-nariz-de-garrafa (Tursiops truncatus) da Marinha dos Estados Unidos equipado com um localizalizador em operação de detecção de minas. Svenska: En flasknosdelfin (Tursiops truncatus) på minröjningsuppdrag i den amerikanska flottan. Türkçe: Mayın tarama çalışmalarında kullanılan bir afalina (Tursiops truncatus). Yunusun yüzgecinde mayının yerini belirleyen bir alet bulunmaktadır.